The 4th of July is right around the corner, and we're always looking for fun ways to shake up the traditional BBQ menu that we typically serve. 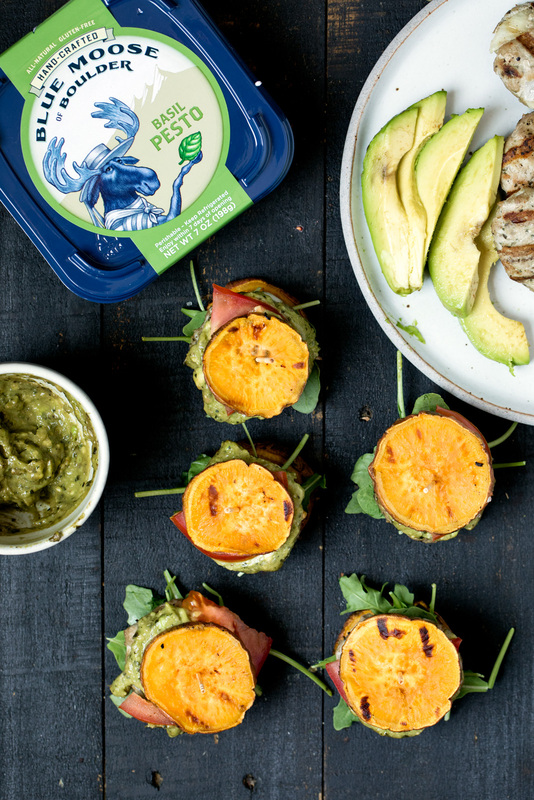 These turkey pesto sliders by Ambitious Kitchen are just what we were looking for - and we were so excited to partner with Blue Moose of Boulder and Monique to bring you this fun & healthy recipe to serve. Blue Moose of Boulder's Pesto and Hummus's are hand-crafted and cold pressure packed which allows these tasty dips to stay fresh without pesky additives! Be sure to grill these up next week - and find Blue Moose near you here or visit AmazonFresh! In a large bowl add lean ground turkey meat, garlic, onion, pesto and salt and pepper and mix with clean hands until just combined. With turkey mixture form 2 inch round slider patties, you should get about 14. Set aside. In a medium bowl, combine sweet potato rounds with olive oil and salt. Place sliders on grill for about 4-5 minutes each side or until fully cooked. If you have room, you can also cook the sweet potato rounds at the same time; they should take about 3-4 minutes per side; just watch carefully so they do not burn. Next make the pesto guacamole by mixing together the avocado and Blue Mouse Pesto. Add salt and pepper to taste. 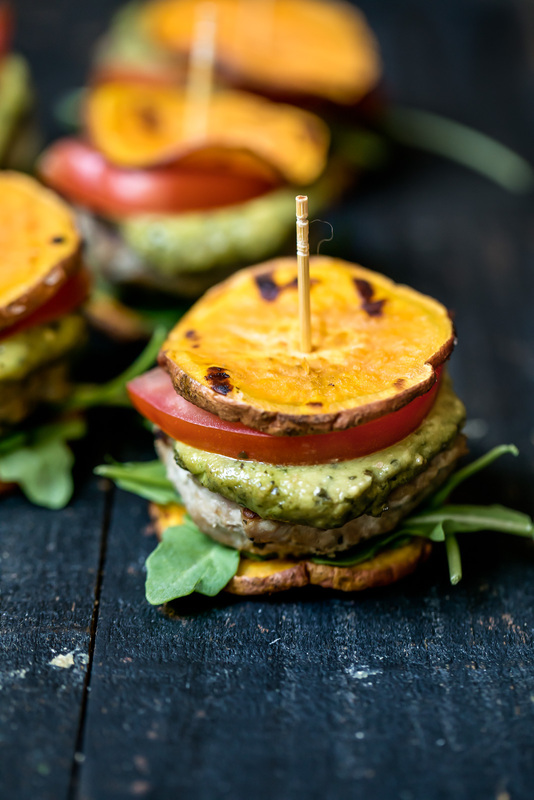 Assemble the sliders by placing the cooked turkey slider on the grilled sweet potato rounds, then top with a teaspoon of pesto guacamole, 1 slice of tomato and arugula. Makes about 14 sliders. Enjoy with the hummus dip if you’d like.